A box shaped vessel of displacement 1640t is 50m long 10m wide and 8m high . Find her KB in SW , if she is one an even keel and upright. A box shaped vessel 60m x 10m x10m floats in DW of RD 1.020 at an even keel draft of 6m . Find her KB in DW of RD 1.004. A triangular shaped vessel of displacement 650t floats in DW RD 1.015. Her water plane is rectangle 30m x 8m . Find her KB . As we know that centeriod of triangle is 2/3rd of the perpendicular bisector of the base .Hence centre of buoyancy will be always 2/3rd of perpendicular bisector of base. A triangular shaped vessel floats in SW. Her water plane is a rectangle 40m x 12m. If her KB is 3.6m, find her displacement . 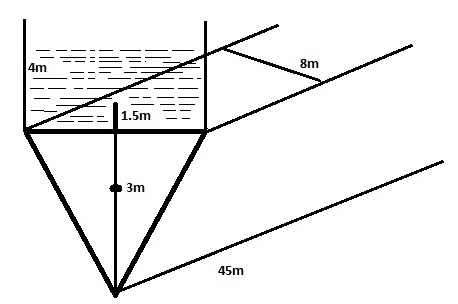 A homogeneous log of wood 3m x 0.75m x 0.75m floats in SW with one face horizontal .If the RD of the log is 0.8m, calculate the vertical distance between its COG and its COB . A homogeneous log of wood of 0.5m square section floats in water of RD 1.005 at a draft 0.4m with one of its faces horizontal . Find the vertical distance between its COG and its COB in water of RD 1.020. Now ,calculating draft for the same displacement at RD of 1.020. A cylindrical drum of 0.8m diameter and 1.5m height weight 10kg. 490 kg of steel is put in it such that it floats with its axis vertical in FW. find its KB . (Assume π to be 22/7 ). According to the question the drawn figure can consist of 3 difference structure ; namely triangle BEC , rectangle ABCD, semicircle AFD . The deck and keel of a flat-bottomed barge and identical. Its sides are vertical. The deck consists of two section – the bow is a triangle 12m broad and measures 12m in the fore and aft direction ; the mid-body is a rectangle 50m long and 12m broad . if it is floating on an even keel in SW with a displacement of 3444t , find the position of its COB with reference to its after end . A barge of 45m long has a uniform transverse cross-section throughout, which consists of a rectangle above a triangle. The rectangle is 8m broad and 4m high. 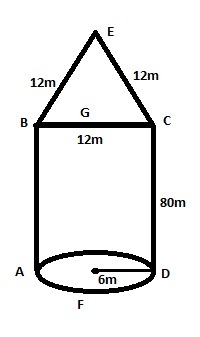 The triangle is apex downwards 8m broad and 3m deep.if she displacement of the barge is 1620t, find the position of its COB with reference to the keel and also with reference to the after and , if it is upright and on an even keel in FW. 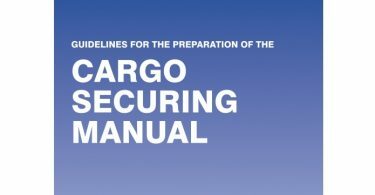 What is Cargo Securing Manual or CSM , its purpose and contents? What is Rudder, its types used on ships in detail ? Howget 54 or 4 m in question 9?